Before becoming the great missionary evangelist, Paul was known as Saul the persecutor of the Christian church. As a devout Jew Saul sought to quiet the quickly growing movement of men and women who followed Jesus Christ. He had permission from the High Priest to persecute those found worshiping the Lord (Acts 9:1, 2). Jesus did not tell Saul everything that would happen in his life in the future, only the next step. Saul obeyed. Saul met the Lord on his way to Damascus to persecute the Christians in Acts chapter 9. There was a bright light from heaven that caused Saul to fall to the ground. The voice of the Lord asked Saul why Saul was persecuting Him. Jesus explained to Saul that when he persecuted the church then he was persecuting the recently risen Lord. Saul’s response was a proper response. He submitted to the Lord and asked what he should do. Salvation does not come from works, but Saul was showing his submission to the Savior through obedience. Jesus told him to get up and go to the city. This is a beautiful picture of obedience to the Lord’s will. Jesus did not tell Saul everything that would happen in his life in the future, only the next step. Saul obeyed. The experience left him blind but obedient. He was led into the city to meet Ananias. Though Ananias had heard much about Saul and was justifiably scared, he too obeyed the Lord and took Saul in. Ananias laid hands on Saul and healed him of his temporary blindness. Saul was not a novice to the Scriptures. He was a devout Jew and knew what God’s Word said. Previous to his conversion though, he did not believe that Christ was the anointed Messiah. As soon as he believed he began to preach Christ in the synagogues. By Acts 13 Saul had been on the receiving end of the persecution. Others in the church began to hear about Saul and accept him into their congregations. He also started going by the name Paul more and more. The church in Antioch wanted to send out missionaries to preach and start new works. The great leader Barnabas and the growing Christian Paul were chosen. They traveled together and were known as Barnabas and Paul. Barnabas being the leader and Paul the disciple. However, by the end of the chapter they were referred to as Paul and Barnabas. Paul began to take a more active role in leadership and direction for their traveling ministry. To Barnabas’ credit he respected the obvious leading of God on Paul’s life. After this, there was only one other time when the team was referred to as Barnabas and Paul. That was when they returned to Antioch and the church which sent them out. Barnabas was more known as the leader in front of the Antioch church. Though a strong leader, Paul too humbled himself when it was appropriate to allow Barnabas the honor and respect he deserved. They continued to travel together until Acts 15. In this chapter they took opposing views on taking the young John Mark with them on their next journey. John Mark had abandoned them during the first missionary journey and Paul did not want to give him a second chance. Barnabas took the young man and mentored him like he had done for Paul. The result was that two great preaching teams were then starting churches where there previously was only one. Their argument and separation wasn’t pleasant, but it was used by God to accomplish His purposes. There are three missionary journeys of Paul. The first one was with Barnabas and John Mark. They went to the island of Cyprus before heading to the mainland where Turkey is today. Their initial thrust was to the Jews, but after a time they turned their attention to the Gentiles. It was shortly after they arrived in Turkey that John Mark returned to Jerusalem. The second journey is when Silas joined Paul. They picked up Timothy and Luke pretty early in this trip. Though the Bible does not expressly say when Luke joined the team, the language in Acts 16 indicates he joined them in Troas (Luke 16:11). Previous to this time the writer of the book of Acts (Luke) talks about “them” and “they.” However, at this point the language changes to “we.” This was when Paul made his first visit to Corinth where he stayed for about a year and a half. It is possible that Silas stayed there since there was no further mention of him traveling with Paul. The third journey was marked by Paul and his team staying longer at various places. He even stayed at Ephesus for 3 years (Acts 20:31). Paul sent other teams ahead to various places to preach. Timothy was one of the team leaders. This third journey ended when Paul was in Jerusalem. He was arrested there and spent the bulk of his final 10 years in prisons. We know that Paul wrote many of the books of the New Testament. They were written to churches Paul had a relationship with or people that Paul met along the way. Here is a list of the books in the order they are found in the New Testament. Paul probably wrote the book of Hebrews, though the book itself does not claim an author. Paul was taken to the Governor Felix in Caeserea in 58 AD where he spent 2 years in prison. Paul appealed to Caesar in Rome. Through a process of time he finally arrived in Rome. He was under house arrest for a couple more years in which he wrote many of his books. Paul was released from prison and traveled for a couple more years in much of the same territory that he traveled before. He probably died in prison as a martyr in 67 AD. Great article David very insightful and well researched. Another great job David. The life of Saul to Paul is a great example to all people that no one is out of reach of God. Even the worst of sinners can be saved! God Bless! I agree with Derek. Saul to Paul reminds me of my former life, not that I could even come close to Paul, but I myself went from disaster to pastor but only by God’s revelation of Himself and by a light to..a light that is the light of men…Jesus Christ, the Son of God…this, even though I still consider myself a train wreck but He is in the business of setting us on the right track…a highway to heaven so to speak. Nicely done David. 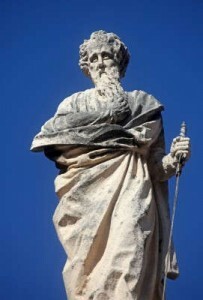 St Paul is my favourite Saint,and i evan named my son after St Paul. No disrespect to St Peter but without St Paul there would have been no Christians. St Paul was a Roman Citizen,and not many people know that though he did not say it himself,but it`s in the bible. Footnote- I hope God knocks my son off his horse,and converts him. I want ask question I need to know, did apostle paul saw a vision consign the heaven or he is the only apostle that saw the heaven . Daniel, we know that John the Apostle also saw Heaven. That is what the book of Revelation is about. Is it appropriate to pray through the Apostles as the Roman catholic do? Acheampong, Thank you for your question. There is nothing in the Bible that indicates we should pray through anyone but Christ. There are no examples in the Bible where people prayed through the power or authority of other men or women. However, the Bible does say that Jesus Christ is our mediator with God. We should pray through Him and His authority (1 Timothy 2:5; Hebrews 4:14, 15). No, only Jesus Christ our saviour. (Roman 4:25) Christ died for our sins and was raised to life in order to put us right with God. So no apostle died for our sins. Great article on apostle paul but I’m looking for more information on the thorn paul was giving. What type of illness he endure? My name is Paul I’m very proud of the name because of the great apostle Paul. what do i say when ipray? As our Creator God, He knows us well. We still have our own struggles as we seek to know Him better AND to serve Him. The Lord’s Prayer, as shared by Jesus is a great start. As your loving Father…and through His Son that is seated at His right hand, (No one comes to the Father but through me) speak to Him out of your heart. Share everything with Him. Your hopes, your dreams, your struggles and ask Him for His grace and mercy on your life as you work to walk more closely with Him. Make Him your best friend and share it all with Him. As we draw closer to Him…He will draw closer to US! God’s speed! I’ll pray for you. All the apostle Paul’s books is my favourit.I want God use like apostle Paul Amen. Thank you Njoiku. We really are not able to send sermons and preaching topics through the mail, either U.S. or foreign national mail or even email. As a pastor, what I do is study the Bible and go thru each verse and chapter and bring out the material and sometimes only use the Bible as my notes. Are you a pastor and if so, from what nation are you from Njoku? Below I created some free PDF Bible lessons that you can use as sermons and use the same format that you will see in these for other subjects. You will understand better after you read and download these free lessons at the link below. Even thou I created them for a prison ministry I have you are free to use them at no cost. Let me know what you do. Thank you. Just click on the link below for free lessons. Saul of Tarsus. Born: Circa 5 AD. Birthplace: Tarsus,Cillicia(Now Turkey) Died: Circa: About 62 AD. Paul the Apostle not one of the Twelve or the Seventy but,a later convert “The Apostle of the Gentiles,” claimed a special commission from the resurrected Jesus,separate from the Great Commission given to the Twelve. Paul did not restrict the term “Apostle” to the Twelve,He evan referred to his mentor Barnabus as an Apostle. If it was not for his writings there would be no Christians today. Thanks for this inspirational write up. More anointing to your oil. I have a question that I need an answer to. What are the notable miracles performed by Apostle Paul? God bless. Thank you for your encouragement. Paul’s miracle were really God’s miracles but God used Paul to do these miracles like Acts 13:6-11 – Paul performs an imprecatory miracle, commanding blindness upon Elymas who was a false prophet. Acts 14:8-10 – Paul heals a lame man in Lystra. Acts 16:16-18, “And it came to pass, as we went to prayer, a certain damsel possessed with a spirit of divination met us, which brought her masters much gain by soothsaying (fortune-telling): the same followed Paul and us, and cried, saying, These men are the servants of the most high God, which show unto us the way of salvation. 12So that from his body were brought unto the sick handkerchiefs or aprons, and the diseases departed from them, and the evil spirits went out of them. I have only one question that I am trying to seek out about Paul. Was he ever married and/or divorced? Reason is because of his writting in I Tim. 3 about the requirements for leaders of the church. Thank you so much Jay Ke for your question. The Bible never says whether Paul was married or not. Some think that he was at one time based on what he said in 1 Corinthians 9:5, “Don’t we have the right to take a believing wife along with us, as do the other apostles and the Lord’s brothers and Cephas (PEter)?” If Paul was married at one time, his wife likely passed away considering he never mentions her in any of his writings. Paul declared that he had the gift of celibacy in 1 Corinthians 7:1-7. Paul’s statement to the unmarried and widows in the Corinthian church gives evidence that he was not married at the time of his writing the letter: “Now to the unmarried and the widows I say: It is good for them to stay unmarried, as I am. But if they cannot control themselves, they should marry, for it is better to marry than to burn with passion” (1 Corinthians 7:8-9). Clearly, he was not married at that time, but whether he married afterward is also a matter of speculation. Anyway, that was the qualifications for a pastor and deacon but not for an apostle for which he clearly was and you can read in the first chapter and verses of each of his letters or epistles. We do not have these available on a file my friend. I am sorry we couldn’t help you with this. What a lovely story! The anecdote surrounded this YouTube video that namely posted by this area is actually a fine one with having good-looking picture feature. Thank you sir. I wish we had more about Paul’s marital life but the Bible is silent on this, so we must be as well. It`s been many years now since I posted here on Paul. Now I have a problem with Paul. He was not appointed an apostle like the 12 and when Judas went his way. The apostles cast lots to make the 12 up again. I found out that casting lots was not some form of gambling but it was a way so God could decide so since they did it in Gods name it was not gambling. When people refer to the 12 Apostles Paul is not one of them. So I take it that Jesus appointed Paul. I visited a site called rodcdavis.com and he condemns Paul has evil through his teachings. I think this guy is picking and choosing against Paul, using the blood sacrifice way of doing this for absolution to God. This guy sticks to it that Paul continued to believe in this which Jesus apposed. Can anybody help me out with this one? Saul becoming Paul God is great. Now the main question. What do you take God for? What do we take God for? God! He is rules and reigns over all. What do you mean “What do you take God for?” I take Him as holy, sinless, perfect, and Lord of all there is. What do you take God for? Jack, l applaud you for asking Adebanjo the same question. I’ll certainly like to get his perspective on it, if he doesn’t take God for the list of attributes you’ve given. As usual, keep up the good work. Thank you my friend for the encouragement. I think the Apostle Paul was a hero of mine who shared the gospel despite severe oppression and opposition. Hi Jack, I want to know what was Paul’s skill in making tent in the book of acts during his mission. How he develop this ability? Would this reasoned allow other missionaries to work and do ministry? More blessing to your ministry ! Hello Prince. What a great question and what a great way to think like a missionary. I don’t know much about Paul’s tent making skills, but he must have been fairly good because it kept his missions supplied and he was at it for at least 3-5 years. Other than that, it might be good to have a skill to be able to support yourself with something you could use as financial support, but also consider, Paul likely witnessed to his many customers about the faith in Christ that saves, so his tent making did two things; support his missions and be part of his mission field. The way Paul lived, is the same way Christ expect us to live. Paul really win souls for Christ. He never gave up at once. I think after Christ, no one did such job of winning souls like Paul.